Unfinished series - the backlash. Well, actually there are many things more annoying than an unfinished sentence, or an unfinished series. But both can certainly be irritating. We don't like to be left hanging. Plenty has been said on the subject of whether an author owes their readers the end of a series just because they sold them the start. I'm not going to talk about that here. What I am going to consider is what impact the delays to certain high profile fantasy series have on the fantasy book market more generally. I was sparked to blog by this thread on Goodreads: I'll never, ever ever, start reading an unfinished series, how about you? It's not unique. I've seen the sentiment expressed many times before. Again, what I'm considering here has nothing to do with the authors commonly brought up in these discussions. There are many reasons why books can be delayed, some of them that only other writers can appreciate, some of them that may be heavily compounded by high levels of success. What I'm interested in is the idea that sizable numbers of readers might genuinely resolve not to start unfinished series. This would be both very unfortunate for many authors, and misguided since the vast majority of series are completed to the publisher's deadlines or within a reasonable period. Many authors produce a book a year ... so to swear off anything new until it is finished would be punishing the many for the misfortunes of the few. The trouble is that the high profile of these delayed series casts into the shadows the fact that the statistical likelihood of any given series being delayed is very small. All but the most wildly successful authors need readers to buy into their series / trilogies early. Without good sales out of the gate the rest of the series can be in jeopardy. It could lead to a decline in the publishing effort put behind the remaining books, which becomes a self-fulfilling prophecy of commercial failure. At worst it can lead to publishers bailing on series, leaving them unfinished, which is exactly what the readers not buying the books were scared of ... they have caused the thing they were worried about ... they have become the thing they hate! 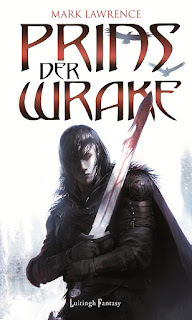 The phenomenon of series being dumped by publishers is much more common in the translation market where the overheads of translating say Prince of Thorns into Spanish mean that each book is more of a financial gamble for the publisher. With translated series if the first book or first two books do not do well ... there will be no more books ... which means readers don't buy series until they are complete ... which means sales are poor and series are cancelled. This particular vicious circle rolls amok through many overseas markets. 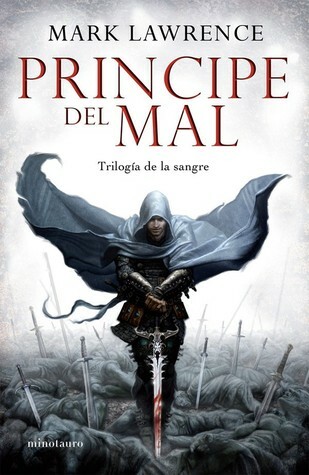 You can buy Prince of Thorns in Spanish, but neither of the other two books. 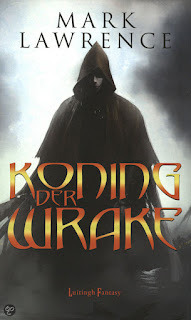 You can buy Prince of Thorns and King of Thorns in Dutch, but not Emperor of Thorns. The trilogy will not be completed in either country. If the mindset that lead to the thread linked above becomes more prevalent in the English language market then the same vicious circle will start to gather momentum there too. It's hard to bring it to a halt though. The series where this has happened are few and far between, but they are also series that in terms of sales stand head and shoulders above the rest of the epic fantasy market, and so their impact on readers' psyche and buying habits is big and grows year by year. The big question is was this just chance or did the success of these series cause the delays, maybe through the pressure of expectation, maybe by changing the lives of the authors beyond recognition? Or was it just chance that this issue hit our most popular authors? All we can do as individuals is to decide whether we want to "live in fear" and choose our fiction cautiously from older, complete series, or whether we will shrug it off, decide to join in at the leading edge and support new talent entering the fray. And of course, whatever negative impact might be speculated upon as a result of the delays in question, the chances are that by raising the profile of fantasy as a whole, and by bringing more readers to the shelves, those series have actually done other authors far more good than harm. SPFBO 2017 -- the finals! The process of selection is now complete and is documented here. 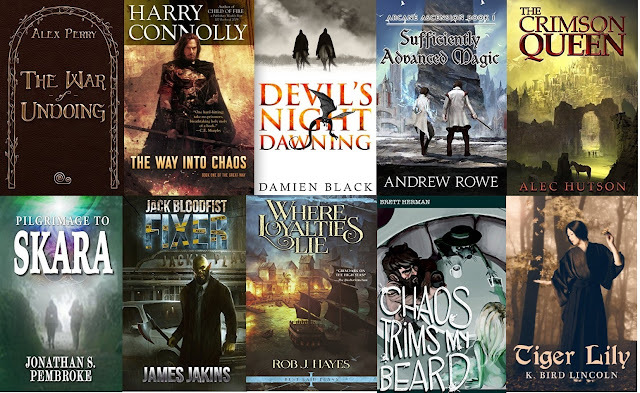 On The Nerd Book Review there are podcast interviews with a good number of SPFBO finalists. Sonya M Black has a good number of interviews with SPFBO authors on her blog. Blogger Jesse Teller has also interviewed a collection of SPFBO authors. A rather brief review since I read the book very nearly 5 years ago. I came to this book with no expectations, finding it on the shelves in my house. Both sons recommended it, but that's not always a recommendation! There are fantasy books that are all about the plot, fantasy books that are all about the characters, and fantasy books that are all about the world-building. This one manages to be all about all of that. The 'big idea' is the demons and it's a good one. I'd not seen demons done this way and the partitioning of them into the night, combined with the system of wards, really works to create a very interesting dynamic. The wards themselves are not only interesting in the sense of a magic system but also in a meta-sense as they are a marketeer's dream. They provide for the fandom almost limitless fuel for fan art, cos play, and branding (not in the literal sense). I've seen a line of wards as jewelry, warding as body art ... it goes on. The main character (first introduce, driving force) is Arlen and although he's a 'farm-boy-rises-to-hero' he manages to overcome the trope and be an interesting character, primarily through his combination inventiveness, down-to-earth morality, and bravery. The other point-of-view characters are also engaging and offer complete a diverse set of windows onto the world Brett's made for us. Arlen's chosen vocation involves a lot of traveling which is great for covering the map and colouring in the detail. The plot works too. Ostensibly the book is about defeating (or surviving) the demon threat, and it has more of that in this first book than the later ones, but even here the politics and character interactions are a major focus. Brett gives us a complex world full of interesting people, and the demons act as a constant source of pressure to drive the characters to extremes. In many ways The Warded Man is old school fantasy, but it's written in a modern style that I found refreshing. A really good read. Anatomy of a burglary - a four-act play. This isn't really anything to do with writing, other than that it has largely stopped me doing any for three days. But it is to do with me and mine, so I may as well put it on the blog since much to my amazement it has been in newspapers, first local then national, on several radio stations, and also both major TV channels. On Monday morning I got up and got Celyn ready for school. I wheeled her out of her downstairs bedroom and was struck by how remarkably cold the house was. I got her medicines ready and gave them to her along with her milk through a tube that goes through her stomach wall into her stomach. Celyn is, as you will have gathered by now, severely physically disabled. She can't use her limbs, talk, or eat. She has a number of other issues that would be headlines for most other children, but those are our headlines. Her enforced silence is perhaps the saddest of those as she has a lively brain, is curious, fond of stories, and has a good sense of humour. As I wheeled her from the kitchen I noticed that the house was in a mess, even more of a mess than one might expect with just me and my grown sons at home. My wife had only left to visit our eldest daughter the day before. Drawers were open, papers scattered, my coat on the floor, pockets turned inside out. The back door was open, hence the bitter cold. Even then I thought maybe a son had been searching for something ... left the door open? In my defence I was still half asleep and I've lived 50 years without having been burgled. It wasn't what I was expecting. The truth though began to dawn. Still, I needed to get Celyn ready for the car that was coming to take her to school. I could assess the damage later. I didn't want to upset her and her eyesight is poor so she didn't notice the chaos. Wobble at the scene of the crime. The cat flap was used to access the door beside it. Note: fingerprint dust is also used to look for shoe-prints and being semi-toxic must be cleaned up before stupid cats lick it. I went into the living room where two very obvious piece of disabled seating sit beneath a ceiling hoist. I was expecting to get Celyn's suction pump, which is used to clear her airways when she chokes or vomits, and her communication device ready to send with her in the car. Both were missing. The thief had left the iPad that the school provides to let us know what Celyn has done in school. He had the presence of mind to identify it and know that Apple products can be tracked. So it wasn't that he wasn't thinking. He saw equipment clearly important for a disabled child ... and took them on the off chance he could make a few notes from them. After I had sent Celyn off I checked the rest of the house. Two laptops (one ancient and one bought the week before to replace it) had gone, a chrome book, the contents of a charity box, and who knows what else ... I don't remember everything in my drawers. Did he take the paperwork needed for identity theft ... who knows. The shitbag had gone through the house after 2.30 AM when my eldest boy went to bed, and before 6:30 AM when I got Celyn up. He must have looked in on her while she slept in her hospital bed connected to a heart rate and oxygen monitor and a machine for supplying her with extra oxygen as she sleeps ... then stolen her stuff. The eyegaze communication device Celyn has is her voice and she had been learning to use it over the past couple of years. It's specialist equipment and the software on it has been built up over time to meet her needs. It costs around £8000 (which since our BREXIT vote is about the same number of dollars). So, I called the police, then vented on Twitter. That tweet went viral. At the time of writing it has 22,731 retweets and 2,826,788 impressions ... whatever they are. I discovered what it must be like to be someone famous on Twitter. There was no way I could see, let alone acknowledge, even a small fraction of the replies. I had no idea that the tweet would spread beyond the more observant portion of my own followers. The viral tweet brought press interest and although I hate speaking on the phone I fielded 50+ calls, spoke on radio and TV, all in the simple hope that the eyegaze machine, having no resale value, would be dumped, and the more people in the area who knew the story the bigger the chance it would be recognised and returned to us. 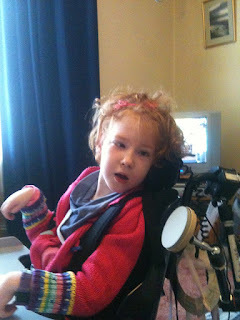 Celyn using an eyegaze machine. The eyegaze machine has a bar at the bottom that detects where Celyn looks on the screen. If she stares at a word or symbol for long enough it activates and the word is spoken for her, or she is taken to another screen where the type of words she wants are located. With the machine Celyn is learning to ask questions, tell us about problems or pain, share her thoughts ... the things we all take for granted. The state is not very good about providing this equipment. If you injured your throat and couldn't speak the NHS would undertake an expensive operation to restore your speech. For children who cannot speak to start with ... funds are more jealously guarded. 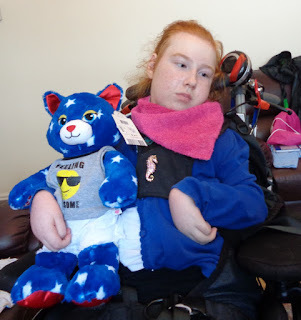 The stolen eyegaze was on loan from Celyn's school but we are liable for it while it is at home, and we are in the process of buying her her own since she hasn't shown herself as capable with it as the authorities require her to be in order to fund it. I rang the insurance company and they told me that when we moved house recently and I moved our insurance across somehow the eyegaze had ceased to be listed as a noted valuable item and was therefore subject to a £1000 limit. I was under-impressed and asked them to find the phone call where this moving of insurance had happened. The police (Avon & Somerset) turned out to be magnificent throughout. An hour after I called the incident in a police officer came to the house and took all the details. It was at this point my eldest son drifted by wanting a cigarette and noted that thief had also taken his tobacco ... a fact that got noted in all the press reports much to my non-smoking annoyance. Although in my viral tweet I had neither asked for help or mentioned the surprising value of the equipment stolen, and at no point subsequently did I ever ask for financial help, I very soon found myself showered with generous offers to fundraise for a replacement. I made this tweet about donating to charity instead. As soon as any Gofundme pages etc were brought to my attention I thanked the organizers effusively and asked that they give any money collected to the Sequal Trust, a charity that provides communication equipment to disabled children and adults unable to fund the devices themselves. I made an angry tweet shortly after being burgled and aimed at friends and followers. It was never about fundraising. Though it did become about raising public awareness so that if the equipment was dumped it might get back to us. The incident obviously struck a nerve and many good people were keen to put some points back in humanity's plus column. It was a wonderful reaction and quickly restored my faith in mankind. It was also a sensible reaction as many parents of disabled children have to give up work to care for their kids and find themselves in dire financial straits, especially when it comes to funding equipment. You might think that equipment is provided for free in the UK. The truth is that much of it is, and the NHS have a lot to be proud of. But there are areas where provision is less good. Access to power-chairs and communication devices is complicated and there is a hurdle to overcome. To get the equipment you have to demonstrate you can use it ... but that takes practice, and how do you practice without the equipment, and how good do you have to be? ... it gets complicated. Anyway, day 2 is when the TV crews come. While they were filming the call came in that an arrest had been made. It seemed likely that the publicity had helped in bringing the suspect to light. I have been told a lot of interesting things about the arrest but sadly I can't share any of the information without risking prejudicing possible future prosecution. Celyn greatly enjoyed the TV interest. By the fifth take of the second visit she was giggling her head off as the presenter fluffed lines, failing to look the distraught child robbed of her voice. Celyn had a bad day. She may well have been missing her voice. We couldn't really ask her. Her voice had been stolen. Celyn can't nod or shake her head. We had good news though. Celyn's eyegaze machine had been found in a public bin and handed in to police. Another case of the publicity helping? We couldn't celebrate just then though - a street bin on a day when it rained almost non stop? The laptop I'm typing on doesn't have a working "p",":","0", or ")" because a year ago I spilled a very small amount of water on it. Would the eyegaze still work when we got it back? The police needed to conduct forensic tests on it before we could have it returned but promised to get it to us the next day. ... AND THEY BOTH WORK!! So, Celyn has her voice back, all her equipment has been returned, and the police and public have together done a remarkable thing! Also, the Sequal Trust charity should be getting over £6,000 from a JustGiving and a GoFundMe page along with many other promised donations. And after all that the insurers said they would cover the eyegaze ... possibly another win for the publicity, though of course we will only now be claiming for the things that remain lost. It has been a traumatic experience but also uplifting in a variety of ways, showing the worst of one person and the best of a great many others. We will be improving our security and moving on. A huge thanks to all. I had quite a few entries quite swiftly and I chose this chapter 1 to start with as it is fairly short and it's fairly traditional. One entry was in rhyming couplets which seemed rather a taxing place to start the exercise! This is actually a prologue. My feeling is that if someone offers their prologue for critique in a Chapter 1 critiquing exercise then we should judge it as if it were a first chapter. If you are not expecting a reader to skip over your prologue (which I used to do habitually in 80s fantasy where they always seemed to be be dull info dumps) then your prologue needs to be as engaging and readable as any chapter 1. A howling night’s gale sharpened its teeth on Tolford’s cheek, licking the warmth from his exposed face. A thin web of branches danced in fervor above him; the arms of ash, cypress, and cedar joining hands to ward against the wind. He stood solemn atop a crumbling stone bastion, olive fingers of ivy creeping patiently up its face. A large fire roared above him; locked away in an iron cage atop a tower, it surged and showered all surrounding in a warm, glowing orange light. Tolford wore brass studded leathers strapped across his chest, and a worn and hole-ridden chainmail coif atop his head. It fit loosely around his shaven chin, for which he was thankful, for every link that touched his skin brought a chill. He stood leaning with both gloves on the walls edge, the standing waters of the swamp lapping hungrily at the dirt banks below Rohn’s Front. The fort had stood since the Second War, built in its infancy, and separated the southern edge of the Central Valleys from the Morass of Rohn. It housed more than fifty men on any given day, with daily patrols who swept the bog’s edge in search of bandit trails; those who would brave the swamp instead of face the lands law. The stench of death was a small price to pay for safety from your own. Tolford was to watch from the wall for any movement, which he found particularly difficult on a night such as this, for it seemed the wind had brought life to everything amongst the trees. Each shrub and misplaced flower stood to beckon in turn, and he found his eyes tired and strained. His eyes wandered skyward in search of rest. The black of night stared back at him, punctured by diamond pins; a thousand and one keyholes to a greater plane. He faced what he knew to be south, and sure enough, Aethera gazed back. The gleam of her eye left the rest in shadow, somehow finding him through the thick tree tops. “And she watches from her kingdom,” his mother would say as she named the stars, so patient in wait for sleep to claim him. As a youth, he often wished he could join her amongst the heavens and explore a realm beyond his own. Thirty two years and nothing had changed. He slipped into slumber as he stood, eyes weighted by a long days watch. A firm hand grasped Tolford’s shoulder, bringing back to the conscious world. A familiar voice said, “Tol, gather yourself. Captains makin’ rounds.” Peter stood behind him, the rough illumination of the tower’s brazier pulling him from the shadows. He spoke through an unkempt, black beard, its odd knots curling over a mail coif. He stood a hand’s height over Tolford, shoulders broad and belly lean. “The wind catches me as well, sends me right off,” Peter said, pretending to fall asleep himself. He laughed and punched Tolford’s shoulder with a gloved fist. “That it does,” Tolford replied, grinning though disoriented. He nodded in thanks and Peter returned a half smile before turning back to his post on the western wall. He had known Peter since his fourth day in the Fort Rohn and he was the only one he might consider a friend amongst the guard. Tolford looked behind himself to the inner fort. Captain Garn was taking his usual route, circling the inner wall from below, torch held aloft. It sputtered and spit hot oil onto the earth, which had been worn by countless steps into a natural path. As he passed each post the guards gave the all clear from above. This was done every night, three times per watch. Tolford thanked his god this was the third. He would be relieved within the hour. Garn passed underneath his side of the wall. Tolford raised a closed fist and Garn returned the same. Turning back from the Captain, he returned his sight to the maze of mossy trees. A shadow jumped from beyond the trees, flashing black in the bright light of the tower fire. His grogginess was ripped away as his heart jumped and his eyes focused. He leaned once more on the stone wall and waited for the shadow to shift again. The tower fire whipped, a mighty gust sending sparks flying free into the night air. The light faded and surged back again as the flame returned. All was still. The wind had died. The sound of crackling embers returned to his ear as the howl subsided. The darkness had a way of prodding the worrisome part of his mind at this time of night. Still, he thought of raising his arm in alarm. It wouldn’t hurt to take a gander, though he didn’t fancy the thought of soaking his boots so soon before he slept. “Watchs Done!” Captain Garn’s commanding voice carried well in the silence. Tolford made his way and lowered himself down from the wall on a wooden ladder propped up beneath his feet, hopping with a grimace as he reached the last step. A young mad clad in identical uniform stood waiting. Tolford did not recognize his face, only the familiar look of exhaustion upon it. They exchanged nods. Tolford turned toward small shack that housed the fort kitchen as he lifted the chain from over his ears, tucking it in a leather pouch around his waist. He let out a deep breath of satisfaction as air rushed over his short, rusty hair. As he walked he worked the aches from his legs in an awkward stretch. Hot, stuffy air filled lungs as he walked through the kitchen door, weighed down by the smell of poorly cooked cabbage. Tolford knew the scent well, as he had eaten more cabbage while stationed here than all his other years combined. He strode over to stand at the food trough, regarding the cook, Bert. He was a large man with little hair, not by his choice. What he lacked in locks he made up for in chins and a kind heart. “Not that it needs it. My thanks,” Tolford replied. In truth, it desperately needed many things, but he would lie through his teeth if it meant staying in the cook’s good graces. “That’s mighty kind,” Bert said. His eyes brightened as he snuck another roll into Tolford’s hand. Tolford raised his bowl in thanks. Peter waved him down as he wandered into the mess hall. He found him at an otherwise empty table, already tearing his roll into pieces to let soak in his stew. “Surprised yer’ not out already, you look like hell, old man,” Peter said, scratching his dark beard as he waited for his bread to soften. He was not much younger than Tolford, but he reminded him often. “Not much better than you, I’d say,” Tolford retorted as he sat down across him. A dull, lonely ache filled his gut. He dug in his soup, grabbing a potato morsel between his dirty fingers and began to eat. The pepper didn’t help. “You know the new bloke on our watch?” Peter asked between bites. “You trust his word?” Tolford asked, pausing with his bowl in his hand. He knew Peter to bite easily on any lure, buying any rumor that came his way as fact. The new blood often had many stories to tell and sold them for favor with the Fort’s Guard; men with too much time for idle hands. “And no better blade,” Tolford said, toasting him with one of his buns. He knew a conspiracy when he heard one and he had heard far too many within these fort walls. He would let Peter have this one tonight; he had neither the care nor energy to counter it in his current state. “Keep calling me that and I’ll put one between your ribs,” Tolford said, standing with a now empty bowl. He slapped down his second wheat bun across the table in front of Peter and said, “Here, you’ll need your strength,” and walked back to return his dishware. Peter called some curse or another after him but he paid little mind, raising a hand in farewell as he left for the barracks. The smell of burning flesh filled his nostrils, another familiar scent, especially this time of year. As he rounded the outer wall of the kitchen he saw the smoke trail billowing into the night air, an acrid fume building. A bright blaze glowed from over the western wall, no doubt a pyre for the freshly executed. As if it wasn’t enough the bog wood itself released a foul scent when burnt, an inconvenience the fort experienced too often on chilly autumn nights such as this. He watched on as two men tossed another lifeless and naked body over the wall. Red sparks exploded in a crunch of timber, drifting with languid reproach as the corpse crashed into the burning pile. Tolford covered his mouth and nose with his hand, which did little to block the scent. He hurried to the barracks some twenty yards away, choking on the plume of justice done. The barracks was a miserable abode by any standard. Four dozen bedrolls lay shortly spaced over a crooked wooden floor, each one as lonely as the last. There was little light in the hall, only a few short candles lit to find your way. Ten or so dozing and snoring men filled the floor, scattered about. Tolford made his way to his bedroll far off in the corner under a breezy window he had fought hard and long to claim. His bed was a simple, cotton roll that stunk of sweat and swamp air. Peter owned the one opposite him. Tolford unclasped his leathers, steel, and satchel. He set them underneath the always open window, before kneeling and rolling onto his bedroll with a grunt. He untied the laces on his dirt caked boots, kicking them off near his armor. He laid still, exhaustion seeping from his pores. For most of the guard, this would be the time to admire keepsakes and trinkets from families or lovers, perhaps only memories of home. Often during this time Tolford would feign sleep and watch Peter from the corner of his eye. Peter always had a simple, silver chain he would run through his fingers when he thought no man was watching. He would fall asleep with it tucked tight to his chest. Some nights, this brought a bubble of envy from within Tolford’s belly. On others, he thanked his god he had nothing to yearn for. On this night he fell into sleep with a mind’s image of crimson sparks glowing against a tar black sky, and the star of Aethera watching over him. Tolford woke suddenly, his skin clammy and aching. His eyes opened to a slate darkness and his ears to crushing silence. He coughed, clearing his lungs with raking pain. A foul taste crept across the back of his tongue. His throat was gravel, grating as he breathed in shallow breaths. He stood, fumbling with his hands to find the waist high windowsill to support himself. He looked through it, searching for a sign of the dawn. He found none. He must not have slept long, he thought. There was an illness about him. Random, sharp pains stabbed at his limbs. He knelt back down, feeling around for his boots, fingers prickling with numbness. Tolford stood, dazed. He took a blind step, bending to feel what would have been Peter’s bedroll. It lay empty, uncovered and cold. His heart lurched into an odd beat. He stumbled to the barracks door, falling over a half dozen empty bed rolls, each as cold as the last. Fear touched him then, a slow caress of horror waking his skin in gooseflesh. The outside air struck him with a cruel emptiness. He strained his eyes, searching with desperation amongst the black, with not a torch or candle to be seen. His heart, galloping now in his ears, drowned the silence. Tolford called out, first for Peter, then for someone, anyone to hear him. He was yelling now, scrambling to the inner keep on clumsy feet. The abyss swallowed his screams and spat back desolation. Tolford fell to his knees, the taste of hot iron searing in his throat. Fingers of dread raked at his skin. His grasped the dirt, running it through his fingers; the only grounding presence in a shrouded sea. Feverish, he rolled to his back and searched what he thought was the sky. She had forsaken him as well. So a while ago I did a series of page 1 critiques on this blog, ignoring my gut instinct that it would end badly. I did end up being attacked in certain quarters for "being mean", and since there's no point putting in the considerable effort just to create ill feeling ... I stopped. Whatever people say, having your writing honestly critiqued can hurt, and our instinct is to react poorly to being hurt. Writers often put their heart and soul onto the page, something of themselves. If they were immune to the sting of honesty in that context then they might well be too walled in to be a good writer in the first place. Critique (and indeed critiquing others) is, however, hugely valuable to a writer who hopes to improve. I still get frequent requests for feedback on writing and my cut & paste reply highlights in addition to my lack of time and possibly opening myself to charges of plagiarism, the following no-win dilemma - why would I invest that amount of effort in someone who is not a friend, and if they are a friend, why would I risk losing their friendship by applying the sharp edge of honesty to it? My proposed solution is to host anonymous Chapter Ones on this blog and to invite feedback from readers and writers. Hopefully some of that will be in the form of detailed technical critique. Since the author is anonymous they will know there's nothing personal behind the responses (& we will know they are here for the writing help rather than the publicity). And since those giving the feedback can choose to be anonymous they will know that it can't lead to bad feeling. So, if you've asked me to read your work and advise you on it in the past, here is a viable alternative. Send me your chapter 1 and (subject to demand & the how well this all works) I will post it here and invite feedback. Quite a few able writers have already expressed their willingness to read and offer advice as part of this exercise. To be clear - I won't be critiquing you. The first chapter 1 for critique is here.